The SanDisk ReadyCache Solid State Drive offers a simple, affordable way to upgrade your system without replacing your existing hard drive. Intended for use as a caching drive, this SSD accelerates storage performance without the need for data migration or OS reinstallation. With sequential read speeds up to 450MB/s**, the SanDisk ReadyCache SSD excels in memory-intensive tasks. 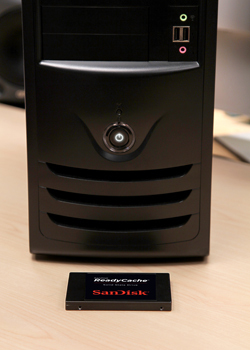 It delivers much faster bootup and load times than a traditional 7,200RPM hard drive1. 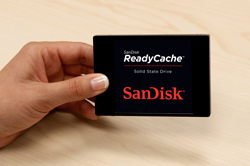 The SanDisk ReadyCache SSD is optimized for use with ExpressCache software from Condusiv Technologies. This caching software automatically caches your most frequently accessed data to improve overall system response times. ExpressCache software is available for download from the SanDisk website2. 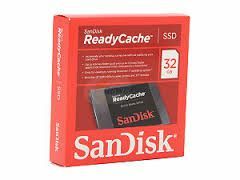 The SanDisk ReadyCache SSD lets you upgrade your memory without the hassle of transferring data or reinstalling your operating system. 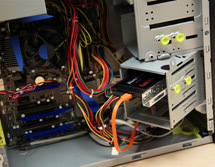 The kit comes with everything you need for installation, including screws, a mounting bracket, and a SATA cable. The SanDisk ReadyCache SSD features solid state architecture with no moving parts. The drive is rated at 4.1 million hours MTBF3 (mean time before failure). The SanDisk ReadyCache SSD consumes only 0.5W while active and places minimal strain on your system's power supply. The SSD is also designed to withstand vibration and shock, and can operate at temperatures between 0 and 70 degrees Celsius. 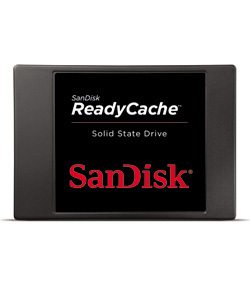 The SanDisk ReadyCache SSD is compatible with SATA 6Gb/s, SATA 3Gb/s, and SATA 1.5Gb/s interfaces. It measures 2.75 x 3.96 x 0.28 inches (H x W x D) and weighs 1.87 ounces. The SanDisk ReadyCache SSD is backed by a three-year limited warranty4. 32GB SanDisk ReadyCache Solid State Drive, 3.5-inch bracket, 12-inch SATA 6Gb/s cable, screws, user manual, and software activation code. ** Based on internal testing of sequential read and write speeds; performance may vary depending upon drive capacity, OS, and application. 1 megabyte (MB) = 1 million bytes. 1As compared to 7,200 RPM SATA 2.5-inch hard drive. Based on published specifications and internal benchmarking tests. 2Windows 7 OS and software download required. Terms and conditions apply. 3Based on internal testing using Telcordia stress part testing.